The wonderful thing about this cake is that it is meant to be baked in advance and frozen until a day or two before you plan to serve it. It is perfect to have on hand in the freezer because all you need to do prior to serving is to let it thaw a bit, then frost it. You really do not want to skip the freezing step in this recipe. Freezing the cake is what gives it its moistness and doing so is part of the recipe instructions. You'll want to plan to have it in the freezer for, at least, a couple of days prior to thawing and frosting it, but the cake can be frozen for up to three months. Yields 10 - 12 servings. Grease two round cake pans with butter (bottoms and sides). Line each of the cake pan bottoms with a circle of parchment paper - cut to fit. Grease the top of the parchment paper with butter. Set aside. In a small bowl, combine the 3/4 cup of milk with the 1 tablespoon of white vinegar. Allow to sit until a bit bubbly and frothy. Using an electric mixer, combine the wet ingredients of the cake into a large mixing bowl - the eggs, 1 teaspoon vanilla, 1/2 cup shortening, the milk/vinegar mixture and mashed bananas. Mix until well blended. Incorporate the dry ingredients of the cake - the flour, sugar, baking soda, baking powder and salt - into the wet ingredients. Once fully incorporated, divide mixture between the two cake pans. Bake for 25 minutes. Transfer the cakes - leaving the parchment paper still intact to the cake layers - to a cooling rack. Once fully cool, stack cakes on top of each other. Freeze in an airtight container or wrapped well in plastic wrap. Freeze for, at least, two days, but up to three months. Remove from freezer and allow cake to thaw in fridge until ready to frost. Prepare frosting by cooking the flour and the 1 cup milk in a small saucepan over medium heat until thick. Allow to cool. Using an electric mixer, combine the 1 cup sugar, 1/2 cup shortening, 1/2 cup softened butter and vanilla in a mixing bowl. Incorporate in the cooled flour/milk mixture. Beat until thick and creamy. Remove parchment paper from cakes. 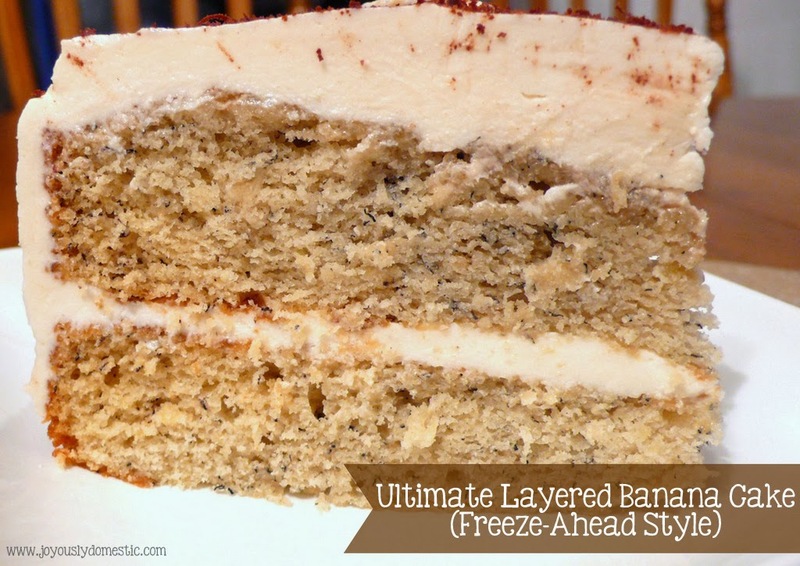 Place one cake layer down on a cake platter and spread about a fourth of the frosting onto the bottom layer. Place the second layer on top. Frost the top and sides of cake with the remaining frosting. Refrigerate cake after frosting until ready to serve. Shaved/grated chocolate or chopped nuts can be used as a garnish on top of cake if desired. Cake can be served cold or at room temperature. 2013 Recap - What A Year!